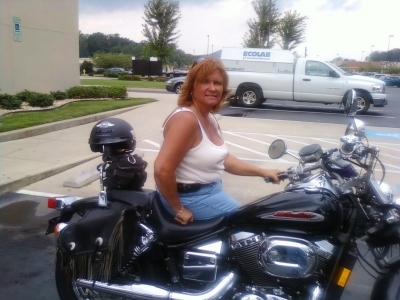 My bike, Thelma, is a 2001 Honda Shadow Spirit 750. She sits low to the ground and is very confortable. I admit that when I first bought her, she felt huge but now that I've gotten accustomed to this model, I absolutely love the size. She has a wide feel, yet very sporty. Unlike the Harley Sportster, she doesn't have that "top heavy" feel. I've added accessories and had her painted. I'm still adding accessories a little at a time. I've been thinking about getting another (bigger) bike, but I'll NEVER get rid of Thelma. The Honda Shadow Spirit is a very dependable, affordable, low-maintenance, fun bike and I would definately recommend it as a great bike for women riders. 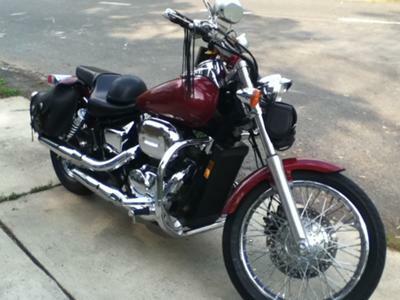 Comments for 2001 Honda Shadow Spirit 750 - "Thelma"
I agree, I just got a Shadow 750 vtl and I LOVE IT!!! I call her Bad Nana - and she and I go everywhere. She was a little top heavy at first, but now I feel pretty comfy with her...great bike for a grown woman.